When the Founding Fathers decided that a person should be at least 35 years old to be President of the United States, the life expectancy for a white male child at birth was slightly less than 35 years. Did they intend that the Chief Executive be at death’s door before taking office? No, 18th century expectations for a typical adult’s life span were not far from our own. Back then, if a man made it to his 50th birthday, he could expect to live another 21 years. But high infant and child mortality rates reduced the likelihood that a boy born in 1789 would live 57 years, which was George Wasthington’s age at the time of his inauguration. It was not until Theodore Roosevelt – the youngest President ever – took office after McKinley’s death that the Commander in Chief’s age fell below the life expectancy for white males. At about this same time, the average life span was increasing sharply. At the turn of the century, expansions in medicine, like the sterilization of surgical equipment, kept adults alive longer. Years were added to the average life expectancy at the same strong rate until the 1950’s, when increases leveled off to more modest improvements. 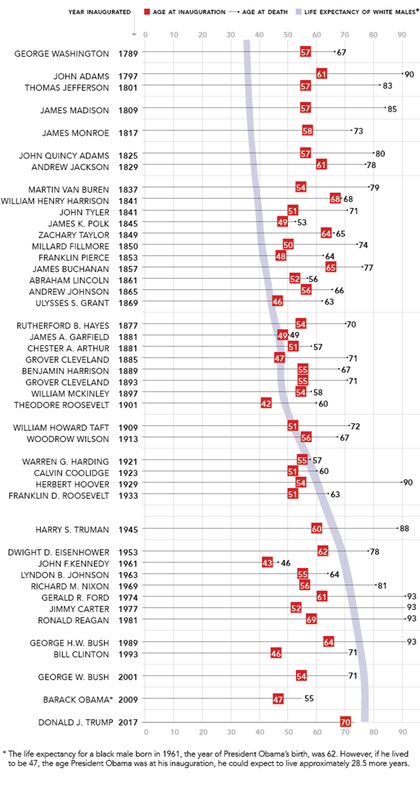 The median age of US presidents upon taking office is 55 years and 6 months. The youngest president elected to office was John F. Kennedy (43 years, 236 days). He was also the shortest-lived president when assassinated at the age of 46 years, 177 days. The oldest president to assume office is Donald Trump (70 years, 220 days). The oldest living former president is George H. W. Bush born June 12, 1924 (93 years, 252 days). * Jimmy Carter is the 2nd oldest, born October 1, 1924 (93 years, 141 days) – only 111 days younger than Bush. The youngest living former president is Barack Obama, born August 4, 1961 (55 years, 183 days). Bill Clinton, born August 19, 1946 is a distant second (71 years, 184 days). The president with the longest retirement is Jimmy Carter who is still alive 37 years, 30 days after leaving the presidency. Three presidents – Donald Trump, George W. Bush and Bill Clinton – were born in 1946 (all within a span of 9 weeks). This is the only calendar year in which 3 presidents have been born. * For currently living presidents, their longevity is calculated as of President’s Day, February 19th, 2018. Frank Freidel and Hugh S. Sidey, “The Presidents of the United States”. The White House. Robert S. Summers. “POTUS: Presidents of the United States”. Internet Public Library. This information, and the accompanying chart, has been adapted by the Bernhardt Fudyma Design Group from an article written by Richard L. Berke that was originally published in The New York Times on May 5th, 1996. The full article is available on The New York Times archives.